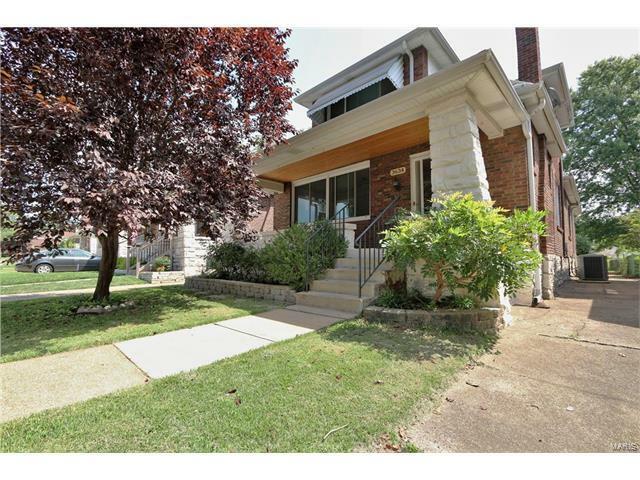 On a quiet tree lined street in South City sits a wonderful brick home full of original charm. Covered front porch, art glass windows & beautiful hardwood flooring are just a few of the many features of this fine home. As you enter the home you are greeted by the expansive Living Room with Gas Burning Fireplace flanked by built-in bookcases, leading into the Formal Dining Room with French Doors, offering a convenient storage area. Large Eat-In Kitchen boasts ample cabinet/counter space with island overhang extending seating & a Breakfast Room. Full Bath is accessible on Main Level. 2 Master Suites! Main Level Master Suite boasts walls of windows & walk in closet; Upper Level Master Suite offers a large Sitting Room & 3 Closets! Rare find! 2 additional Bedrooms offer plenty of space for any size home! Relax on the raised deck overlooking the fully fenced backyard. 2 Car Garage & Parking Pad! Prime South City Location! Close to restaurants, shopping, parks & major highways. A must see!